I tried to fit our three day desert tour into one blog, but there were just too many photos that I wanted to share. Day two of our tour took us to the White Desert, a small part of the giant continent spanning Sahara Desert. 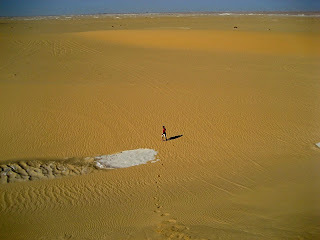 The White Desert was the reason I had heard about the desert road and why we booked the tour in the first place. Our morning started off with the standard Egyptian breakfast. It didn't matter that we were camping. We had almost the exact same breakfast we had every time someone else provided breakfast for us. I think the one difference is that we had cookies and that happened to be the same cookie that Betty kept buying for me based on weight. A lot of the Egyptian cookies were wafer based and not cutting for it what I wanted it taste or calories (calories = weight). Me at the bottom of a dune. After breakfast we were back on the road for 4x4 in the sand shenanigans. They weren't nearly as nerve wracking the second time. I was definitely enjoying more of them today until he tried to turn right off a dune where there was vegetation he could not run over on the bottom. He had to slam on the breaks. We stopped where the dune starts to angle down, but were not facing down yet. I felt like we were going to tip over. We couldn't back up. As he inched us forward, I felt like we tipped more. Eventually, he got out to dig a little. Then, he zigged. Then, he shimmied and, since I am writing this, we made it down the dune. After that adventure and trying to go as fast as possible (>55mph) on the sand straightaways, his shenanigans took us to two different springs in the desert. Driving down the sand dunes. The first spring we stopped at was the Magic Spring. Near it, there were two decaying bodies from the Roman era. Our guide didn't have any history on them. I am guessing they ran out of supplies and chose to at least stay near water. In addition to the dead guys, there was a palm tree and two trucks full of guys enjoying their holiday. Somehow, the holiday of Eid was STILL going on. We think that was the last day, but we thought that too many other times to be sure. Dead bodies near the Magic Spring. I can't remember the name of the second spring. It had a lot more stuff growing there. We also saw dog tracks there. I know the spring is a source of water, but I can't imagine where it gets food. This spring was more pleasant. That might have been because the group of guys at the Magic Spring were not around to ogle Thea and Betty. In Egypt, they have both grown accustomed that behavior, but still don't appreciate it. It was extraordinary to see these springs with vegetation, even a palm tree, in the middle of no where. Somewhere in our day, we stopped for lunch under a tree. Our guide told us to be sure to watch our for snakes. As I walked around to go to the bathroom, I kept my eye on the sand. Suddenly, something slinky fell out of the tree on a branch a few feet in front of me and surprised me. It was a snake. I know snakes can live in trees, but that is not where I instinctively look for them. The rest of lunch went on without incident. We even saw some butterflies in the tree. Having snakes and butterflies in the tree seems a little weird. Something that I did not expect was how easy going to the bathroom in the desert would be. It is just like camping where you dig a hole and bury your waste. However, the digging is a lot easier. I found it kind of funny that going to the bathroom in the desert required less thought than most places in Egypt. At most places, I would wonder if there were squat toilets, if they had toilet paper, or the last year they had been cleaned. In the desert, you have none of those issues. It reminded me of Antarctica where I didn't have choices so I didn't care, but if I do have choices, I am pickier. Thea and Betty hiking in the White Desert. Mushroom and chicken (the second rock) in the White Desert. The finale of our day was the White Desert. It seemed manic compared to the rest of the serene desert that we had been visiting. There were these giant white cliff formations everywhere. There seemed to be no rhyme or reason to them. The yellow sand surrounds these white rocks that just shoot up into the sky. That area is the most crowded part of that part of the desert. We had only seen 2 other trucks the entire day, but as it got darker, we saw more and more. Our guide drove for twenty minutes before he found a campsite where no one else was in sight to preserve the idea of being alone out there. Looking for cool rocks near the White Desert. Our second night was similar to the first. Peace. Quiet. Good food. Full bellies. Bedouin tea. I slept well in the desert. None of us had tents. Just sleeping bags and blankets. It is so nice to be able to camp out and not worry about being harassed or the elements. It was a great way to wind down the trip before heading back to the craziness of Cairo. Sunset in the White Desert. Moonrise in the White Desert. Teatime in the White Desert. The next morning, we were up at 4am to start heading back. We wanted to get back to Cairo by noon so that we had enough time to get Betty ready to go the next morning. We made a quick stop at Crystal Mountain. It is a large rock that, as far as I can tell in the dark, is one giant geode. I would love to go back there at some point and see it in daylight. It wouldn't be the coolest thing you would see on the tour, but it is definitely worth a stop. On our way back to the oasis to get our ride to Cairo, two things happened of note. First, we did not run out of gas despite Betty worrying about it for the past day (she's a city dweller who never drives). Two, we had to cross three police checkpoints. Our guide had lived in the area his entire life and resented the checkpoints. When we were approaching two of them, he turned off his lights and went off the road and around them. He said the police don't like it. They didn't give any kind of pursuit or raise any kind of alarm though. Maybe it is the same type of security as the Temple of Philae. Maybe they didn't see us because our lights were off. I don't know. Time to go Cairo. Getting crushed in the White Desert (Yes, this is staged).